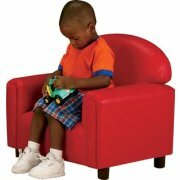 Sized for preschoolers ages 3-6, these sturdy units have an appealing cozy-cushioned design that will add a comfortable, homey look to any day care center or nursery.This is definitely furniture kids can play on - and will still look great - year after year! 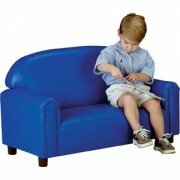 Special Dura-Care fabric upholstery resistant to liquids and stains. Dura-Care fabric is 100% breathable.